A magnificent, traditional, fully-staged opera, Tosca is set against the dramatic landscape of Rome and the Napoleonic Wars. It tells of Floria Tosca’s true love for artist Mario Cavaradossi. Tosca is forced to enter into a deal with the Chief of Police Baron Scarpia, in order to save Cavaradossi, her lover, from execution. 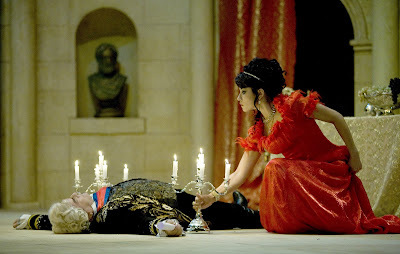 Scarpia’s price is Tosca’s seduction, but she cannot go through with it, and in desperation she stabs Scarpia to death. Cavaradossi is executed and, realising all is lost, Tosca throws herself from the battlements to her death. In preparation for the current tour and her new staging of Tosca, Ellen Kent took a trip to Puccini’s house in Italy. Ellen Kent said: “It was quite magical. I didn’t think it would be quite so inspiring. It was almost eerie – exactly as you would imagine Puccini to have created, with beautiful memorabilia everywhere. There were his shoes and clothes and pipes and all the models of his operas and his actual scores with all his notes on them”. She added “My productions are always rather beautiful and I suddenly realised that in my view, I have been doing what Puccini would have liked and wanted. It felt like meeting somebody I knew”. With a spectacular new set built in the UK by Set up Scenery, who builds sets for the Royal Opera Covent Garden. This most popular of operas, with its tender and moving arias Recondita Armonia, Vissi d’Arte and E Lucevan le Stelle, is a heady mixture of true love, torture and treachery, with two of the best roles for tenor and soprano, plus a pure evil villain as the baritone. VLADIMIR DRAGOS returns to sing his most famous role of Scarpia after his acclaimed portrayal of Rigoletto on Ellen Kent’s last tour.